A semi-retired researcher from Charles County can thank her play strategy and Lottery luck for her latest Maryland Lottery win. The 58-year-old’s Powerball wager in the Oct. 10 drawing grew into a $50,000 prize. 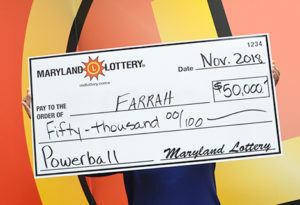 The winner, a regular Lottery player going by the nickname “Farrah,” said she thought up a string of five lucky numbers and had the terminal quick-pick the Powerball number on her winning ticket. That random selection made the difference, turning what might have been a $100 win in the drawing into a third-tier $50,000 prize! The lucky player said she routinely uses this method and plays a combination of family birthdays. She also plays entire quick-pick tickets. The Southern Maryland resident discovered her good fortune shortly after the drawing, first noting the result when she scanned the ticket using the Lottery’s mobile phone app. Players hoping for a lucky Powerball win of their own can try their luck at Charles County’s latest lucky spot. Joe’s Groceries & Liquors, the site of her big win, is located at 8355 Marshall Corner Road in Pomfret. This entry was posted on December 4, 2018 at 12:03 pm and is filed under All News, Charles News, County, More News, z 600X120 Top Ad Bottom, z 600X120 Top Ad Top. You can follow any responses to this entry through the RSS 2.0 feed. You’ve got her face completely covered. Whos is she? Who is she?